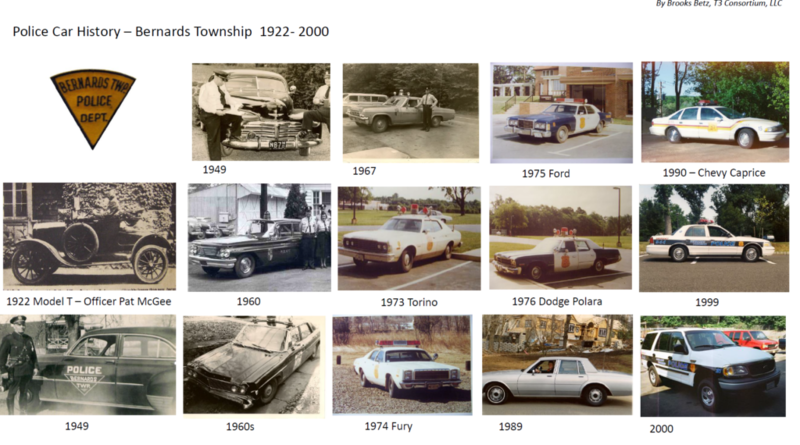 On April 10, 2019 the Bernards Township Police Department will be celebrating 100 years serving the local community. From their beginning as a detective society to the current force they are today, we honor their history. Search social media using #BTpolice100 or tag any stories or images you post with #BTpolice100 and see what comes up. About 130 years ago (1868), the bells of the Presbyterian Church in Basking Ridge rang out for more than religious reasons. The “voice” of a citizen’s crime prevention network, the bells tolled for sinners as well as for saints, rousing deputized civilians from their homes in search of suspected perpetrators. 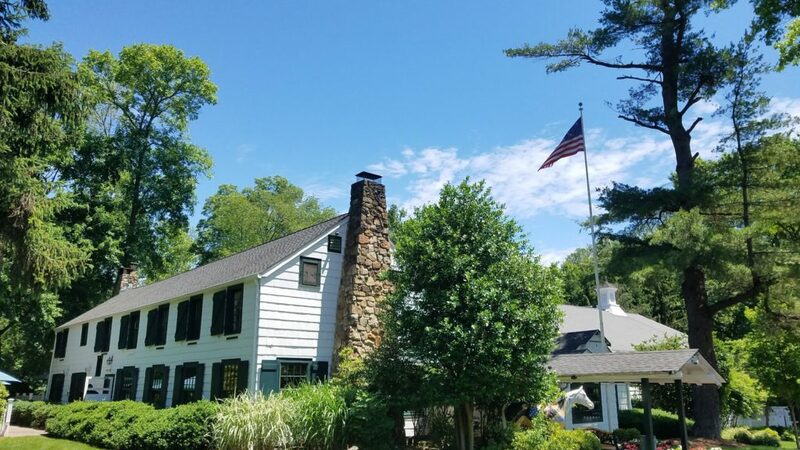 The Basking Ridge-Millington Detective Society used the church bells much as the volunteer firemen now use Township sirens to summon volunteers for urgent services. 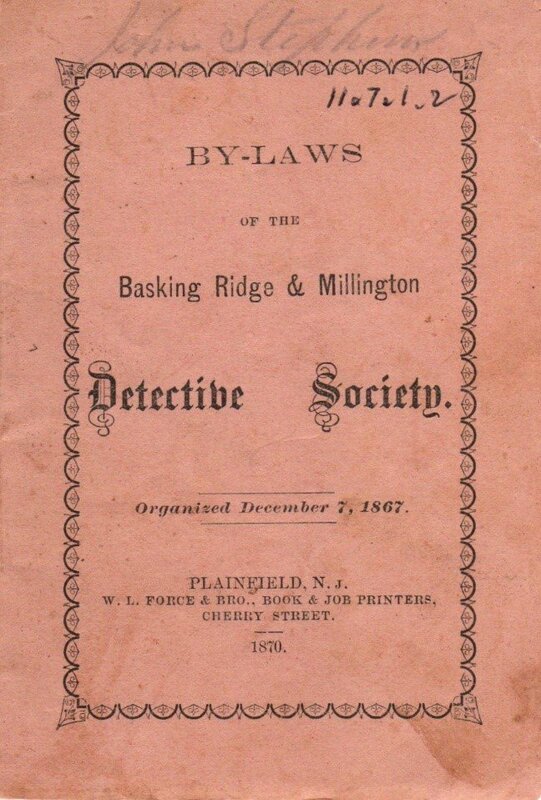 By-Laws of the Basking Ridge & Millington Detective Society, organized December 7, 1867 (3″ x 4 ½”). The Society, established in 1867 with 84 members, was the forerunner of the local police department. 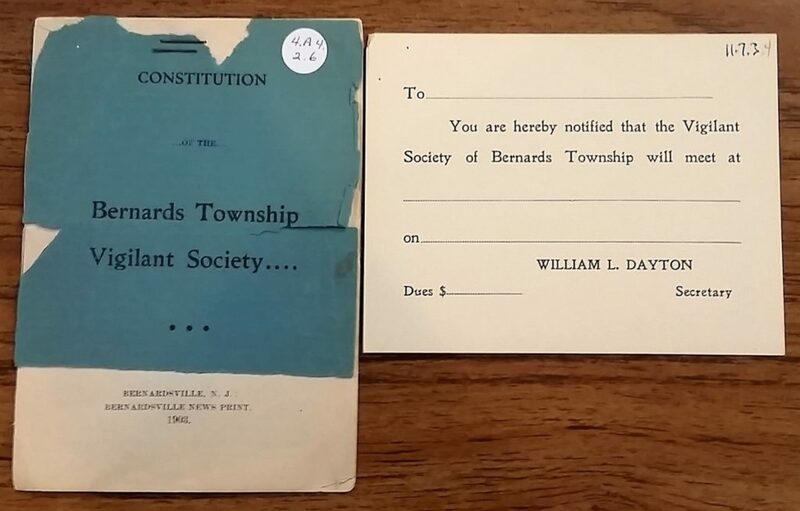 That, with the Bernards Township Vigilant Society of 1903 and the Bernards Township Protective Association of 1918 are largely forgotten today in local history. Many townspeople do not know there were these groups. After the Civil War, unemployed people during the Depression of 1869 became hobos and tramps, rode the rails and also became horse thieves and child snatchers. 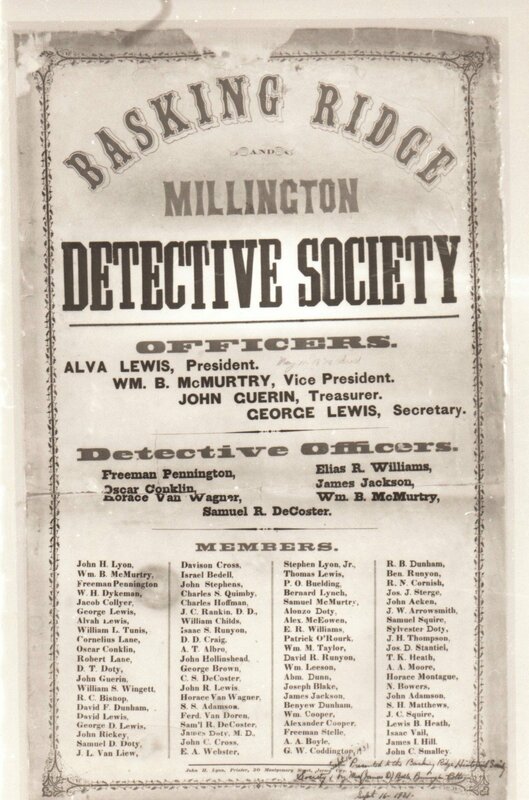 The Basking Ridge-Millington Detective Society had its roots in these post-Civil War years. Petty crime was rampant. At the Brick Academy in Basking Ridge, younger children were relocated to the top floor of the building, with the older students on the main floor of School District #12. None of these “police” were professionals. All had full time day jobs and would patrol at night. Some commuted into New York, after the rail­road arrived in 1872. Most of the men were the “upper crust of the community. Very few people were arrested. The “detectives” would hang out, if expecting many people to arrive on the trains, go down to the station and follow them. These wealthy citizens would arrest Germans, Italians and Irish, who mostly were domestics getting into trouble with liquor. Arrests could be for public drunkenness, petty thievery and assault and battery, horse thievery, and house robberies. Constables were hired per arrest, a transition from all civilian volunteers to a professional force. Vintage crime in the early part of the 20th Century included stolen chickens, hay, tires, beehives; runaway carriages; gamecock betting; stealing furs from traps; escaped veterans; wild and barking dogs; break and entries; gypsy bands; vagrants and suspicious characters— persons warned and placed on good behavior. 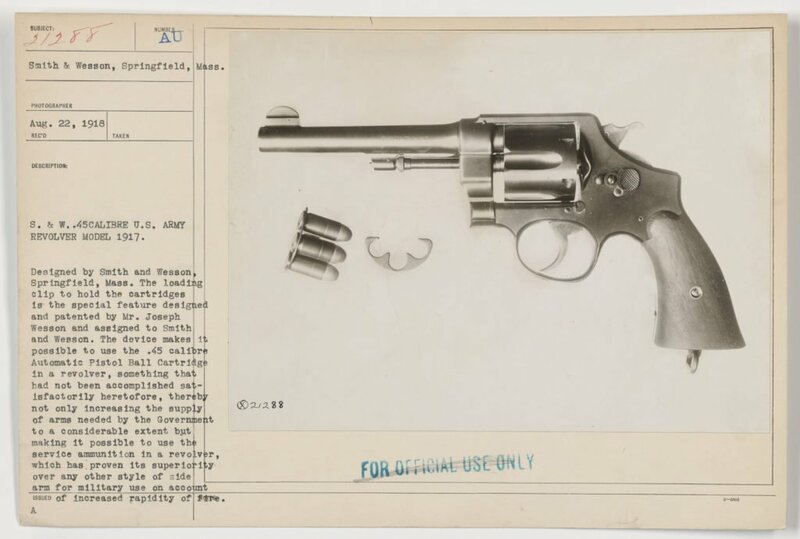 Early 1917 expenses of the fledgling force included: police caps were $2.50 each; badges, $1.20 each; Smith & Wesson guns, .38, $15.90/each; cartridges for Colt pistol, $19.33; flap holsters for a Smith & Wesson, $15.00 a dozen; police winter suits, $30 each, summer suits, $27.50 each; Chester A. Carling earned $80 for patrolling Basking Ridge for a month. 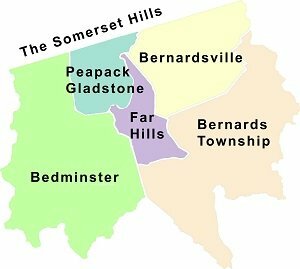 Until 1924, Far Hills and Bernardsville were part of Bernards Township. They separated to form their own governments in 1921 and 1924 res­pectively. Because a large majority of part time policemen were from Ber­nardsville, Bernards Township relied on a part time chief and “rent-a-cops” for many years, who were called as needed. 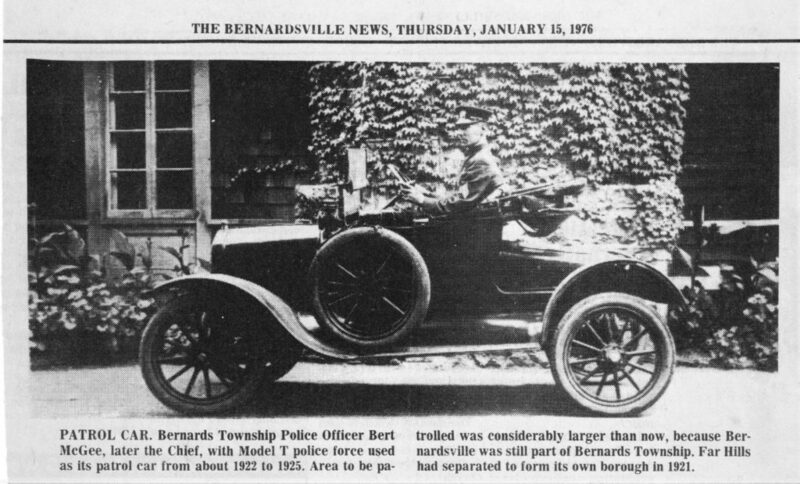 On Tuesday, April 8, 1919, at the Bernards Township Committee meeting the Bernards Township Ordinances were adopted establishing the Bernards Township Police Department. Areas protected were Basking Ridge, Liberty Corner, Far Hills, Lyons and Bernardsville. Mayor Peter V. Stryker, chairman of the Township Committee, officially was named Police Chief. John A. Roebling of Bernardsville was chosen Assistant Chief of Police. 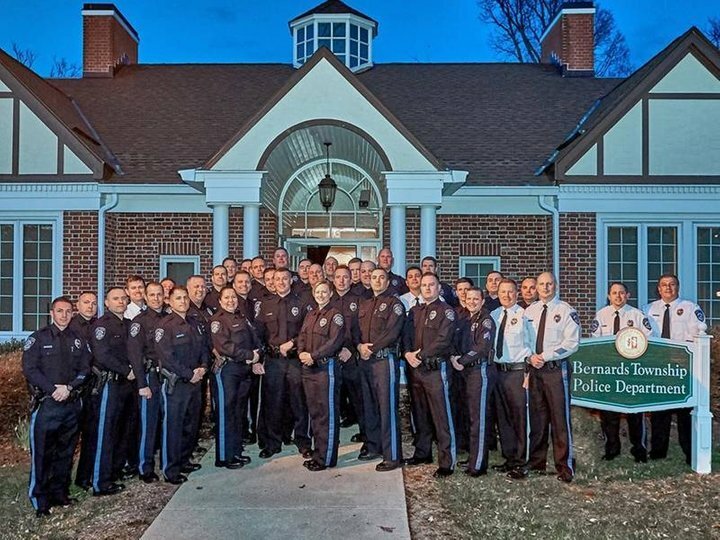 Note that there still would be a Bernardsville Police Department as well as the Bernards Protective Association. It was later reported that even in September 1919 the Bernards Protective Association was still in business as it raised over $3000. $1167 of those funds were given to the Police Department. Many of the members of the force included those from the famed Bernards Infantry Company who had seen service in WW1. 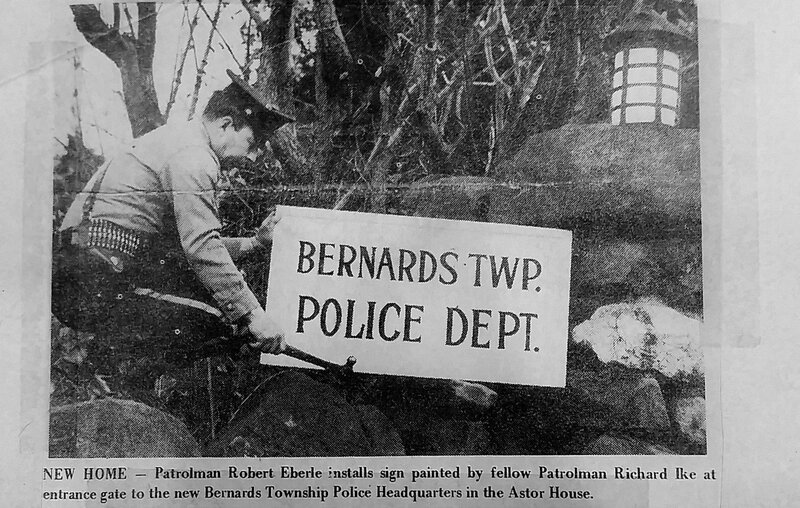 Policeman Rules were part of the ordinances that officially created the Bernards Township Police Department. 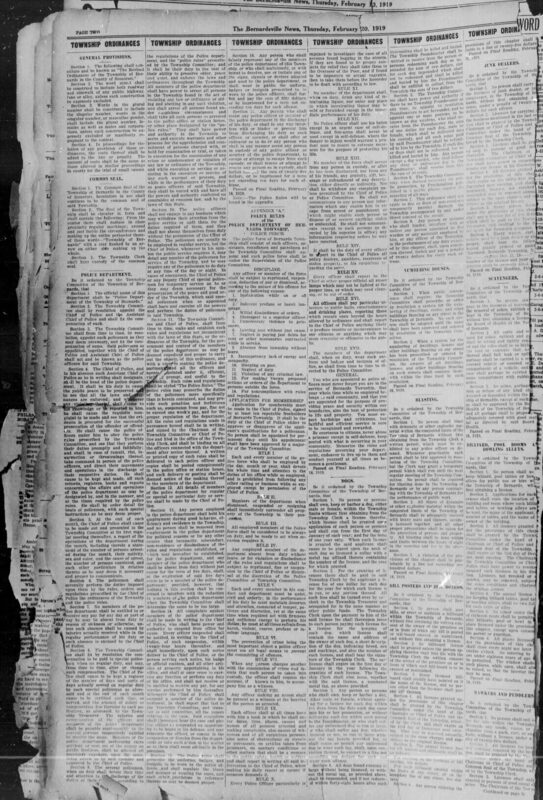 Source: Bernardsville News, February 6, 1919. 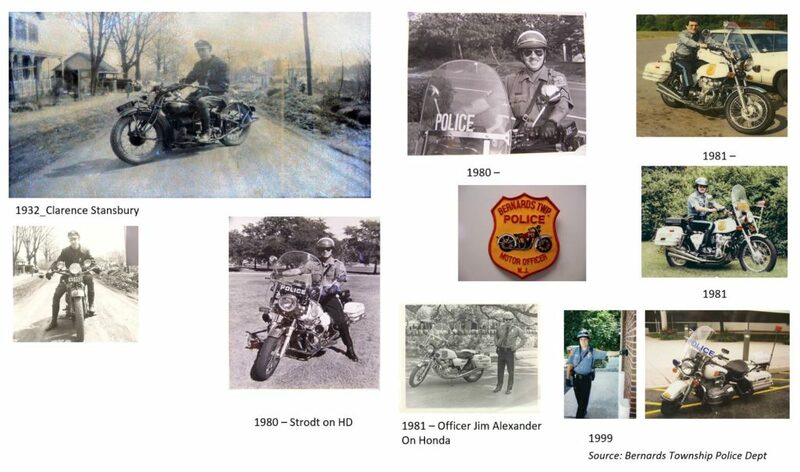 It was also noted that the Assistant Chief of Police John Roebling donated the first motorcycle to the Bernards Township Police Department in September 1919. It was a new Indian Motorcycle from De Bows in Bernardsville, who also sold Studebaker Motorcars. Roebling had given a similar Indian Motorcycle to the Bernardsville Policed Department the year before. 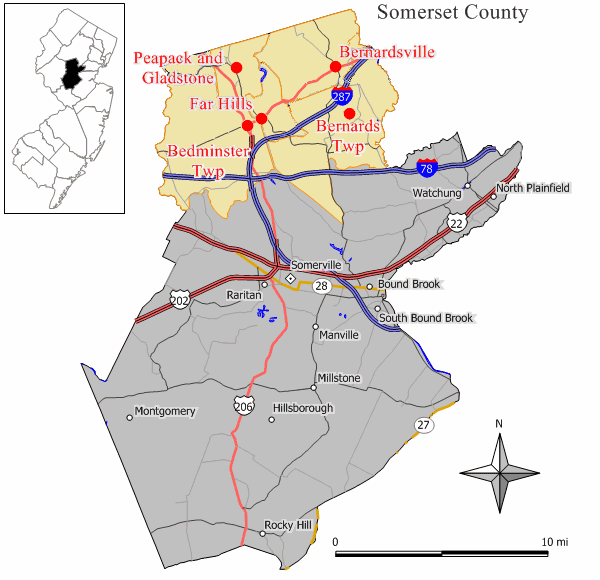 With Bernardsville as a new municipality, Bernards Township was without full time personnel until 1947. From 1924 until 1947, there were special officers and special police chiefs. In the 1920’s and 1930’s, the Township hired cars for out-of-town trips at $1.00 per hour. 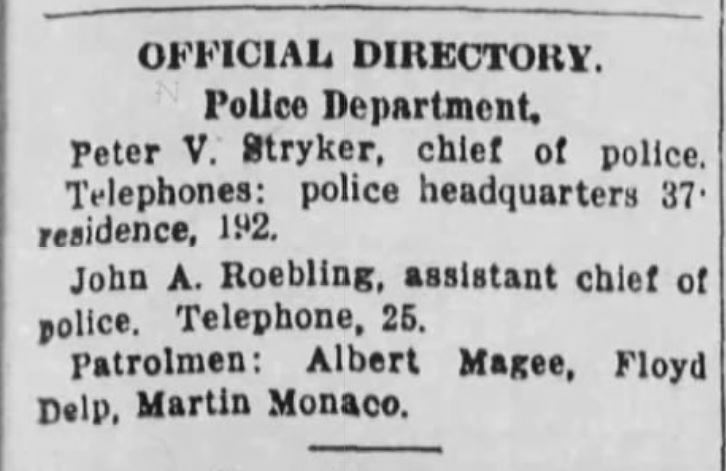 Of the earliest police items recorded by Chief Stryker, one was to obtain three motorcycle officers to regulate traffic at a wedding on Forrest F. Dryden’s estate in Bernardsville on June 21, 1919, a request from the Newark Police Department. Part time Chief Bert Magee had a Model T. police force patrol car from 1922-25. The only village police force was a constable, usually an old man. Magee, as chief, recorded 106 vagrants (suspicious characters), 66 people warned and placed on good behavior and there were 97 public complaints. Bernards Township struggled with a full time chief on a part time basis. Its equipment included:18 rifles, three 38 revolvers, 3 sets of handcuffs, 5 police clubs, 14 police badges, 400 .38 caliber cartridges,1 Chevrolet touring car and two old motorcycles. The Municipal Court was located in Bernardsville. The jail was in the basement of the old firehouse on Mill Street, with prisoners in jail for overnight detention, at a cost to Bernards of 50 cents each. The Bernards­ville Police Chief was in charge of the jail. 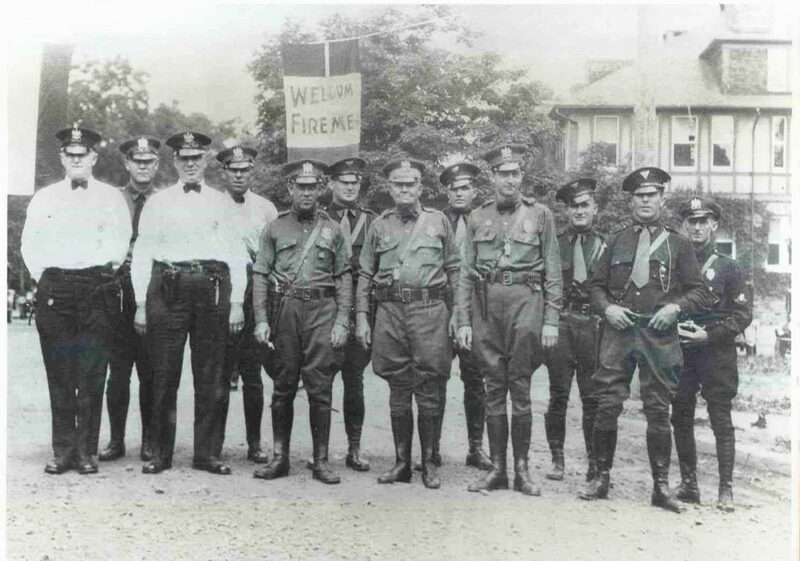 One of the earliest photos of the Bernards Township Police Department – June 21, 1929 @ Maple Ave School – We’re Looking for names on our FB page! In 1929, Harold Pope as constable received 90 cents an hour for patrolling and B.A. Richardson earned $5.00 for patrolling the Township for five hours. 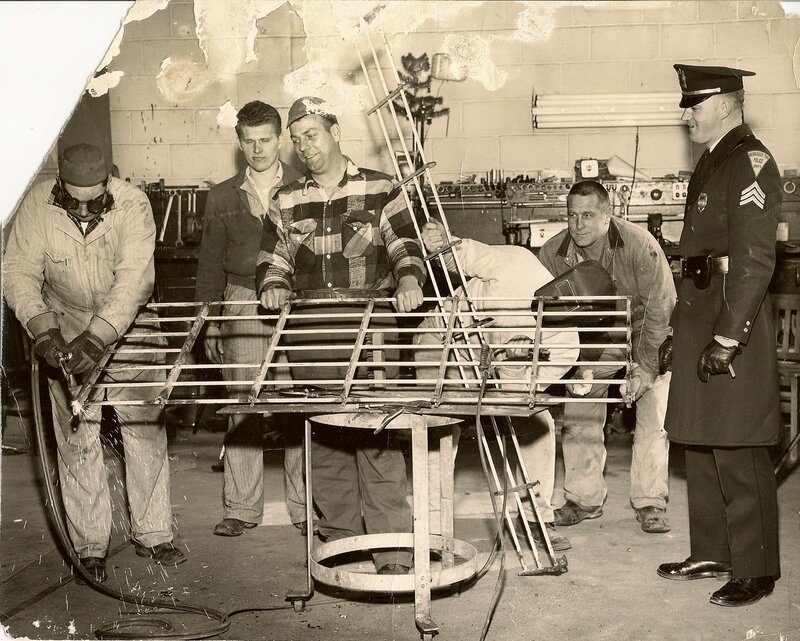 By 1933 Louis Allen, supervisor of roads, was chief, receiving $200 a month for both jobs; Clarence Stansbury earned $6.87 for 7 1/2 hours of duty at the Basking Ridge Fire Company’s carnival and Thomas Stewart got $6.50 for seven hours. 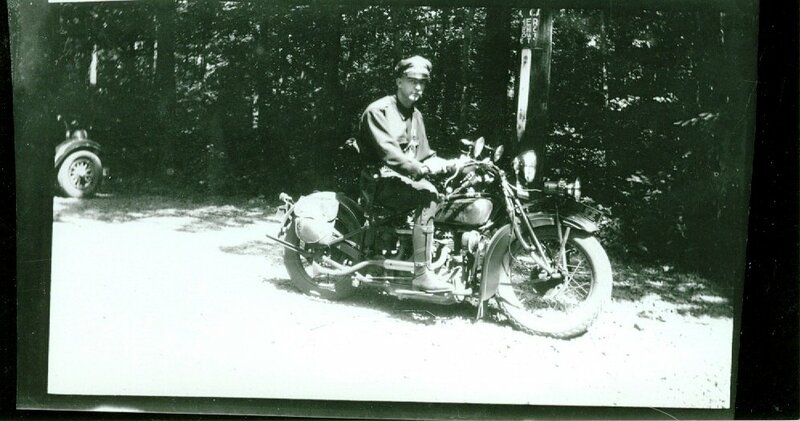 1932- Clarence Stansbury – Patrolman serving on the motorcycle squad. Supplies needed in 1933 for the Township Police were purchased at Brown’s Store and included: paper clips, 10₵ cents a box; buck shot, $1.25 a box; 10 batteries for flashlights, $1.00; lunch for two while on a hold-up case, 70₵ cents. Ralph Bechtold and Charles Fennimore Jr. escorted insane persons to Trenton. Clyde L. Wolfe, officer for the N.J. Division of Motor Vehicles in its Bernardsville office, served as a police chief, and organized parkers for the police department when requested for large parties on the local estates. On May 4, 1947, W. Robert Moore was appointed a full time police chief, serving until 1951. Some of the duties during his term included traffic at an air show at the Somerset Hills Airport; shooting a cat having a fit; a missing child found under the child’s bed; riding horses on the railroad tracks; illegal still found; benches in front of the Liberty Corner School placed in trees; an outhouse upset and put on its side; an illegal pinball machine; and runaway pigs uprooting gardens! 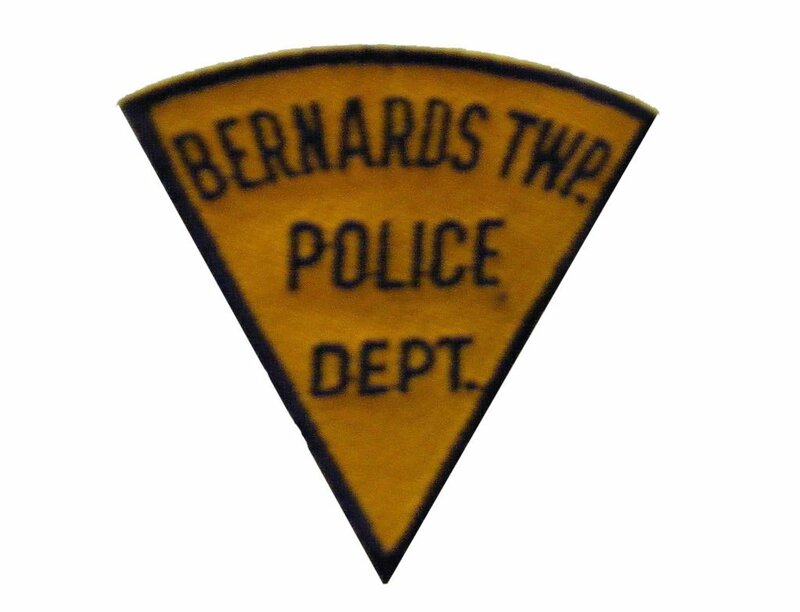 On April 20, 1950, Harry M. Allen became Bernards Township’s first full time patrolman. 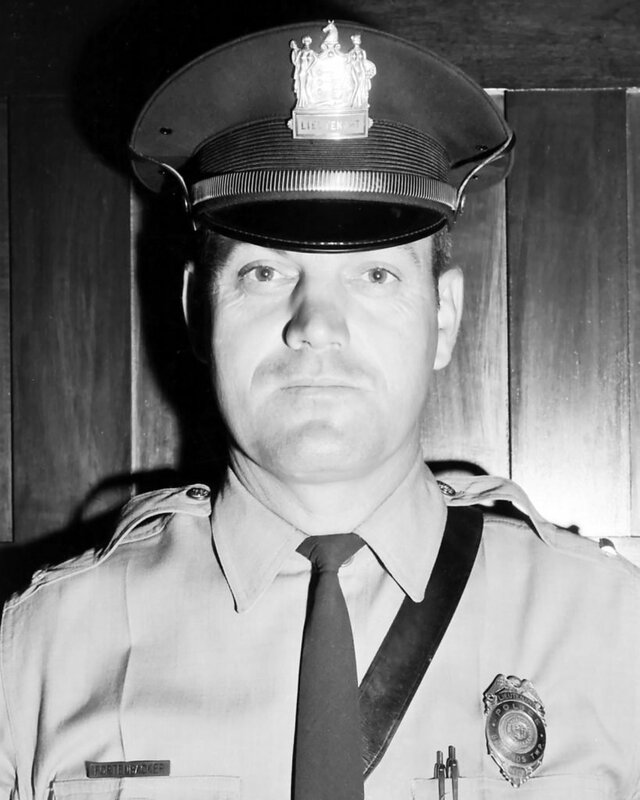 Robert J. Moore had joined the force in 1948 while his father was chief. Police training was not yet mandatory. There was a three-man department in operation. Moore had worked at the North Jersey Quarry under former part time police chief Thomas J. Stewart. In 1950 Robert Moore was part of the effort to make police training mandatory in New Jersey. He was a member of the fifth graduating class at the N.J. Police Academy in Trenton. 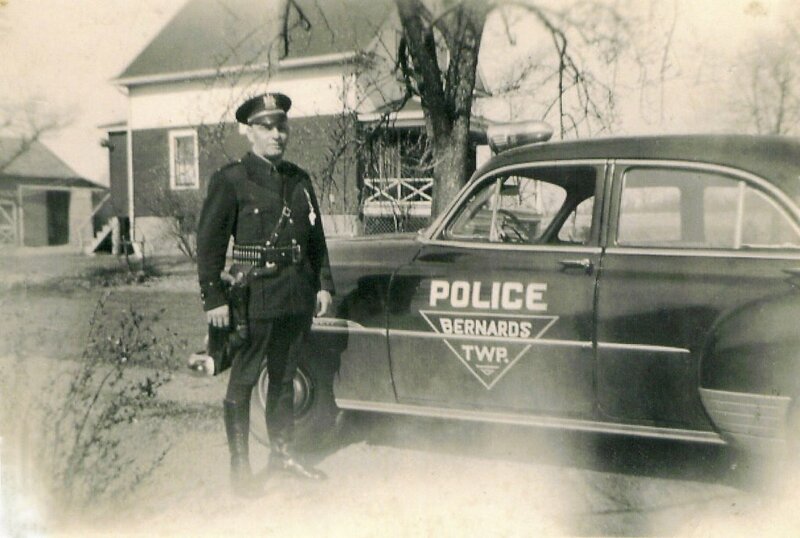 Bernards Township Police Department c1949. Source: Bernards Police Department. Note: This image is on our FB page – we’re looking for names. So far Frank Wolsky?, Third from Left Harry Allen? Far Right Robert J. Moore and W. Robert Moore. 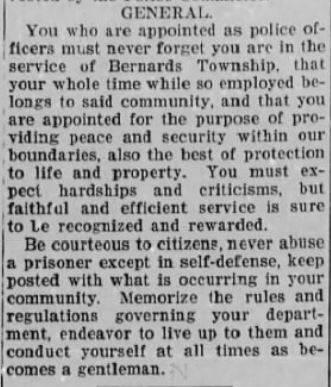 Allen was appointed police chief on July 5, 1951, the only person on the department for about 1 1/2 years. Chief Allen, a member of the Bernards Township Police Athletic League, obtained 275 grandstand tickets for the New York Yankees-Philadelphia Athletics baseball game at Yankee Stadium. Five DeCamp buses transported the avid fans. 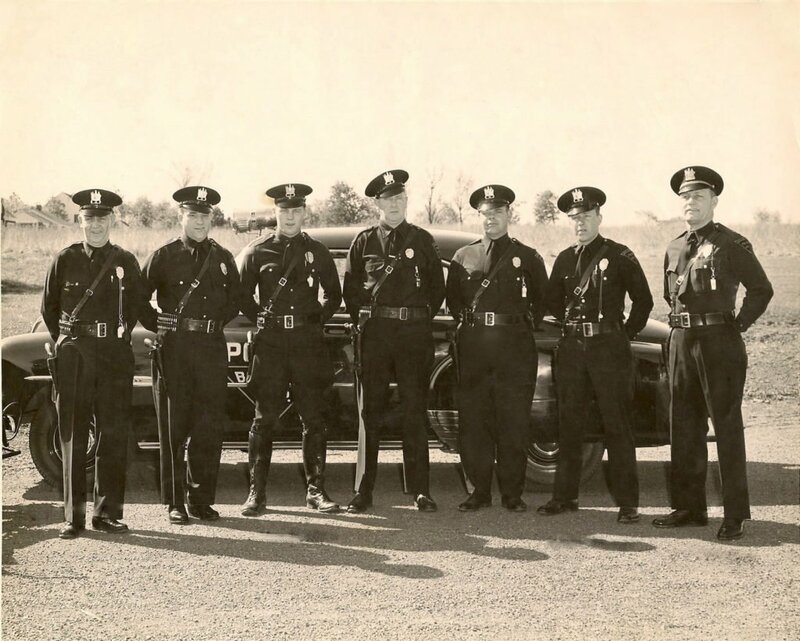 In 1955, Charles J. Fortenbacher joined the police department as a special officer, becoming full time in January, 1956, now a three-man department. Robert Moore succeeded Harry M. Allen in 1977 as police chief, and served until 1991. 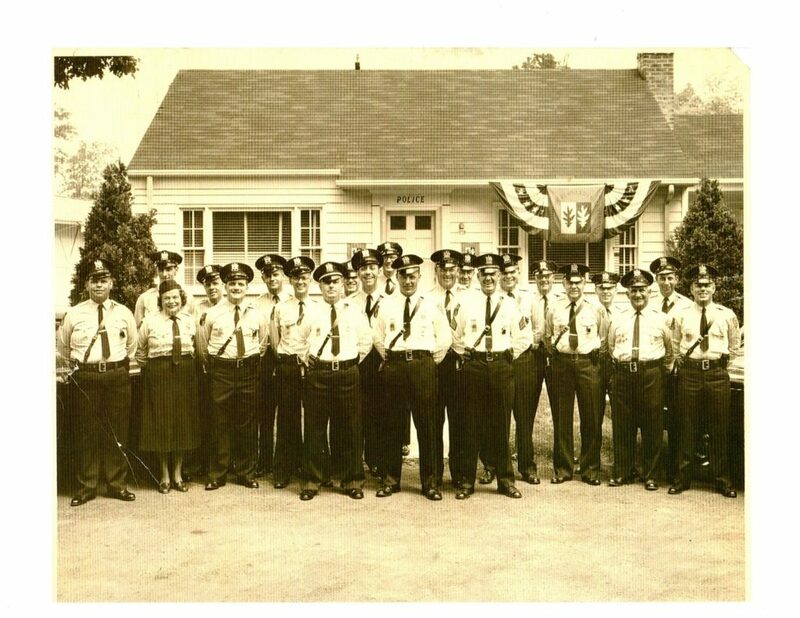 Until the full time force began to expand in the 1960’s, the Bernards police department would operate with 20 or more special officers. They filled in on weekends or were back-ups. 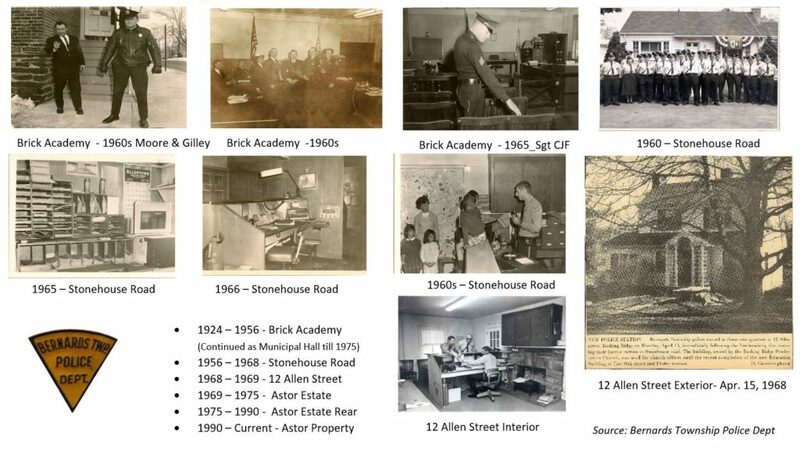 In 1948, the police department was located in the basement of the Brick Academy at 15 West Oak Street, which served as Town Hall. When the clerk left each day at 4 P.M., the Town Hall office would shift to an offic­er’s home where his wife would answer the calls. In case of emergency, a call would be placed to the Morris County Police Radio System in Morris Plains. Officers did their own camera work, their own dusting and lifting of fingerprints, since there were only two people in the Somerset County Prosecutor’s Office. Above: The Bernards Township Police Department has had many homes. Source: Bernards Township Police Department and the Bernardsville News. In 1956 the department was moved to the Public Works building on Stone House Road. 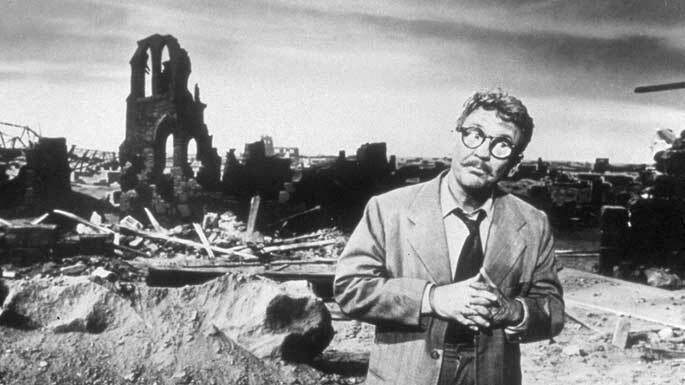 The structure was fire bombed on April 15, 1968. The police were then quartered in a rented house on Allen Street, until Septem­ber, 1969, when they were moved to the recently purchased Astor Mansion on Collyer Lane. They occupied the reception area which is now used for administrative offices. A $650,000 wing was built onto the rear of the mansion for the police department and court room, and the move was made in 1975. In 1967, the department went to around-the-clock dispatching, with four more officers hired, bringing the staff from 9 to 13. The most interesting thing we’ve learned about the history of the Bernards Township Police Department is that there were two fire bombings at the Stonehouse Station Then when the PD moved to the Astor Estate, there was another fire bombing. All three incidents were never solved. 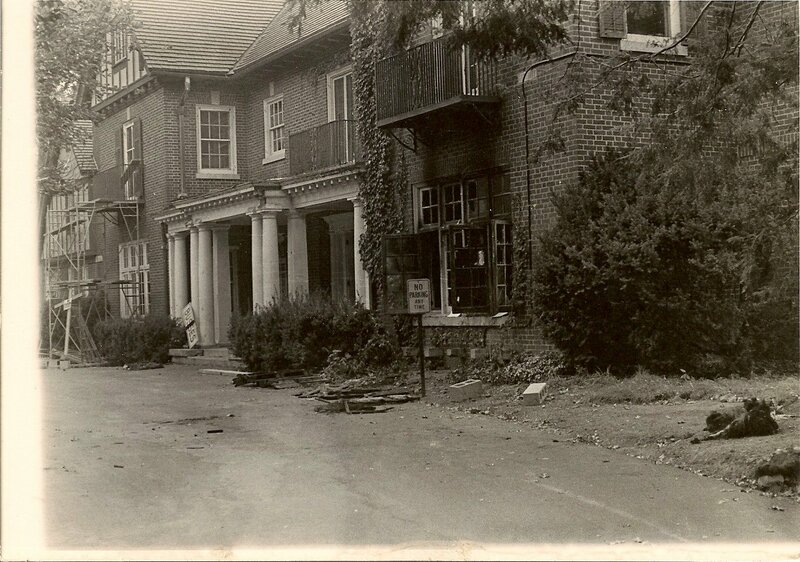 Firebombing at what was the new Bernards Township Police Department in what was known as the Astor Estate. 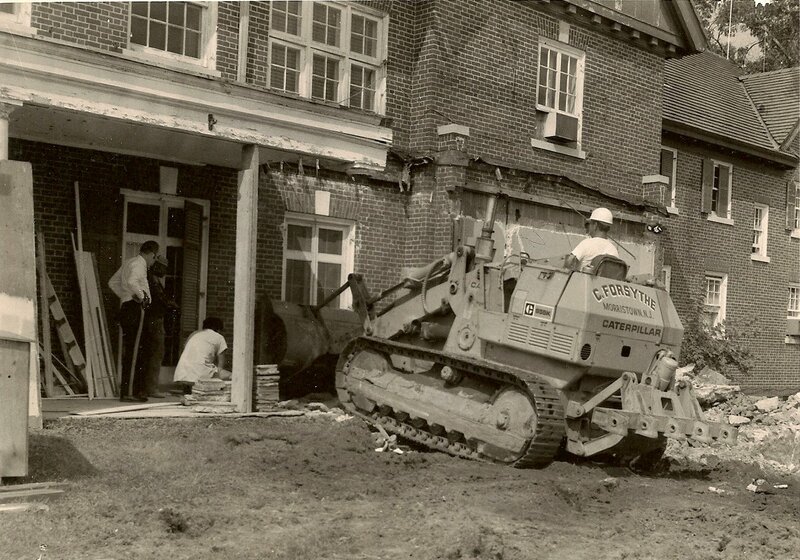 A bulldozer begins dismantling the front of the former Astor Estate to make room for the new police department. On July 25, 1990, the 12,000 square foot award-winning Tudor-design Police Headquarters (its present location) was dedicated on Collyer Lane, adjacent to the Town Hall. Construction on this state-of-the art building began in 1988. Colonel Clinton Pagano, former Superintendent of the N.J. State Police and director of the N.J. Division of Motor Vehicles, was guest speaker at the ceremonies. 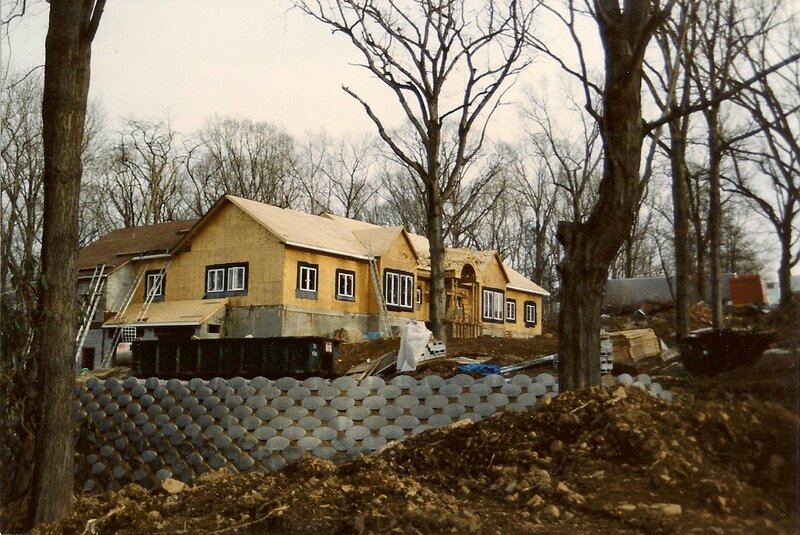 The new Bernards Township Police Department under construction in late 1989. 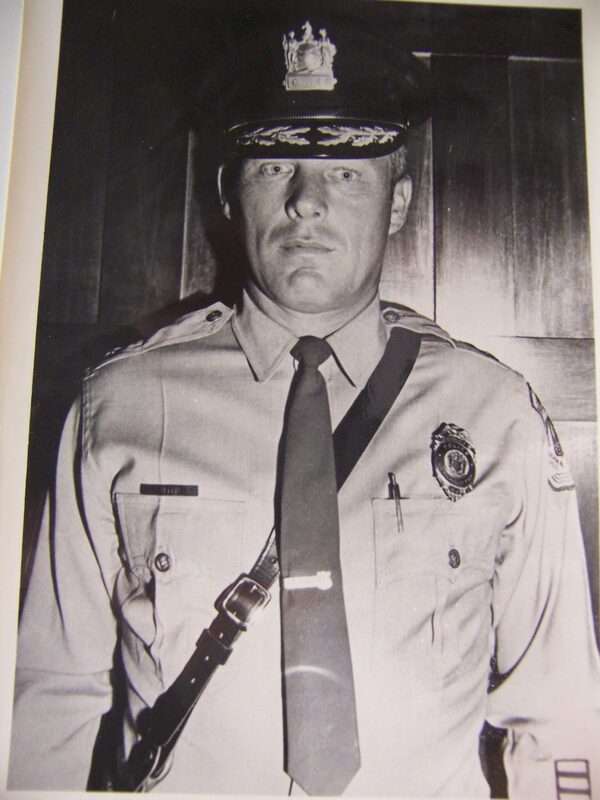 On July 1, 1991, Captain Charles J. Fortenbacher assumed the duties of Chief of Police of Bernards Township, a position he held until retirement on December 31, 1997. Captain H. Thomas Kelly was named Police Chief on January 1, 1998. 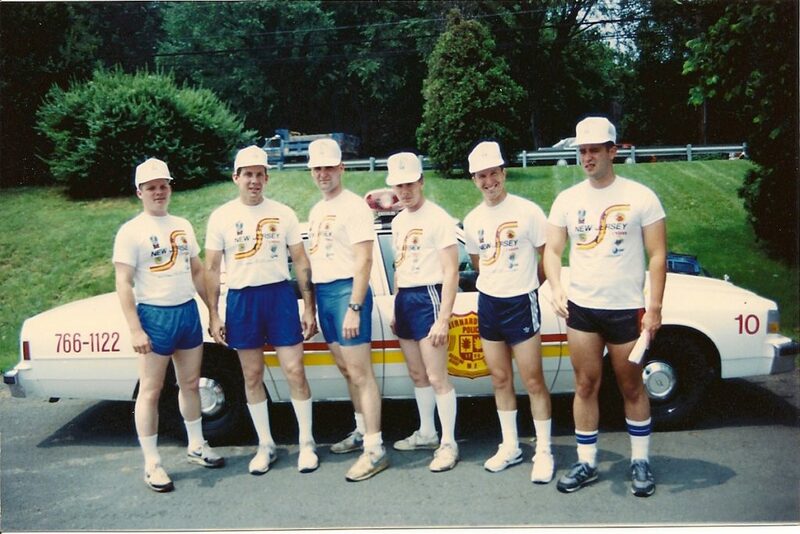 Bernards Township Police have always been community-involved. Programs include the Neighborhood Crime Watch, Project Graduation, D.A.R.E., School, in subjects ranging from radar to alcohol awareness education. A Crime Prevention Education, and serving as instructors at Ridge High School, in subjects ranging from radar to alcohol awareness education. A Community Service program, court-administered, began in 1983. The Police Department has highly sophisticated equipment, operates in the 9-1-1 emergency police dispatching system and uses video cameras. Bernards Township’s Police Department totals 29. The BTPD at its volunteer best. From left to Right: Jim Anthony, Jim Streeter, Dubiel, Ryan, Gover, and Dennis Mott. 1989. 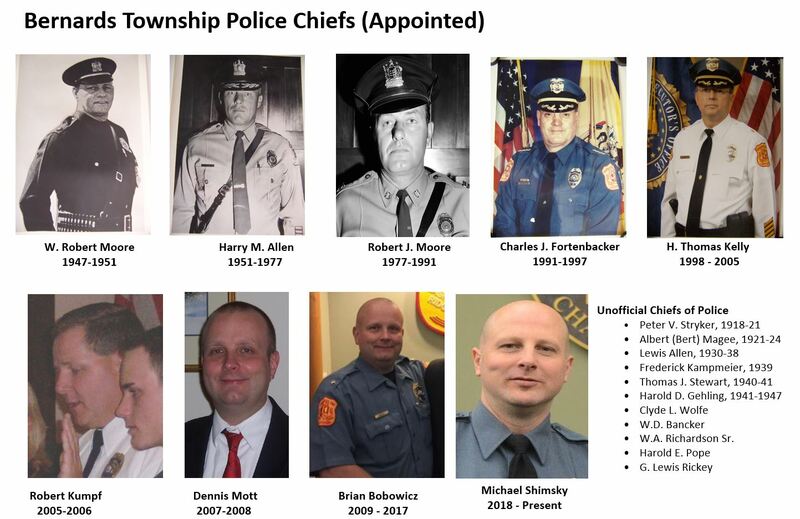 From a population of 3,940 in 1948, Bernards Township residents a three quarters of a century later (2018) number 27,061 —all under the protection of 38 professional law enforcement personnel (2019). We thank and honor our force for all of their support and protection over the past 100 years. In 1956 the department was moved to the Public Works building on Stone House Road. The structure was fire bombed during the early morning of April 15, 1968. – A $650,000 wing was built onto the rear of the mansion for the police department and court room, and the move was made in 1975. 1 Collyer Lane – On July 25, 1990, the 12,000 square foot award-winning Tudor-design Police Headquarters (its present location) was dedicated on Collyer Lane, adjacent to the Town Hall.